Apple’s HomePod, the innovative wireless speaker from Apple, arrives in stores beginning Friday, February 9 and is available to order online this Friday, January 26 in the US. 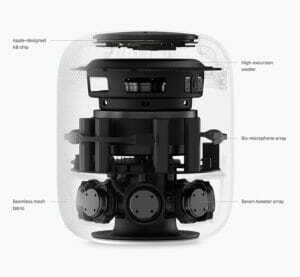 HomePod is designed to work with an Apple Music subscription for access to hundreds of genres, moods and activities. It also learns preferences and tastes that are shared across devices. Using Siri to deliver deep knowledge of artists, songs, albums and more, HomePod can handle advanced searches within Apple Music’s catalog, so users can ask questions like, “Hey Siri, when was this song released?” or “Hey Siri, can you play something totally different?” to change the mood. Apple Music subscribers can enjoy a catalog of more than 45 million songs, combined with their entire iTunes library, for online or offline listening — completely ad-free. With support for HomeKit, HomePod can control hundreds of home accessories or set scenes like, “Hey Siri, I’m home,” to control a number of different accessories at the same time. HomePod can turn on the lights, raise the shades, set the desired temperature or make other adjustments and serves as the perfect home hub, enabling remote access and automations. Through SiriKit, HomePod supports third-party messaging apps, so users can ask Siri to send a message to a friend or colleague using apps like WhatsApp. Reminders, note-taking and to-do list apps like Things and Evernote will automatically work with HomePod, so Siri can set reminders, create a new list, mark items as complete, or create and modify notes. For developers interested in adding SiriKit support, more information is available at developer.apple.com/sirikit. 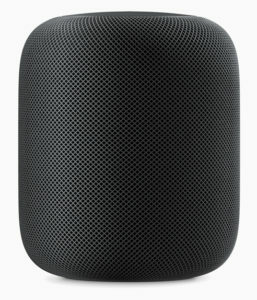 HomePod is available at an Apple retail price of $349 (US) in white and space gray in the US.